The AC Joint is a small joint on top of your shoulder. It is formed where your collarbone meets your shoulder blade. 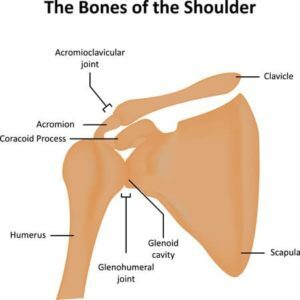 Many people have swelling or prominence on the top of their shoulder and it is likely that this is due to AC joint arthritis. While osteoarthritis of the AC joint is common, it is not always the cause of your pain. 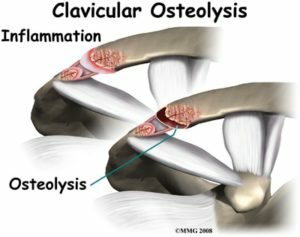 Osteolysis of the distal clavicle is a unique type of arthritis of the AC Joint that is very common in weight lifters. Osteolysis often requires surgery if the weight lifter wants to remain active. Osteoarthritis of the AC joint implies that the cartilage in the AC joint is wearing thin. When this occurs, the bones develop spurs which is why the joint looks prominent. These bone spurs are not dangerous and are not the cause of the arthritis. Quite the opposite, the arthritis itself caused the spurs. AC Joint arthritis occurs commonly in weight lifters at a young age. Arthritis in the AC Joint is found in most everyone else over 50 years of age if a routine X-ray of the shoulder is obtained. Just because you have arthritis of the AC joint does not mean that it will hurt and it does not mean that it needs to be treated. How do we know if your AC Joint is the source of your pain? Many of you have a bump on the top of the shoulder. That is your AC Joint. If you have pain on top of your shoulder and the AC Joint is very tender to touch, then it may be the cause of your pain. Painful arthritis of the AC joint can be mild or severe. If you lead a very active lifestyle the pain could affect your quality of life significantly. When we evaluate people with shoulder pain, the majority of you will have pain because of your rotator cuff. The AC joint might prove to be a contributor to your painful shoulder as well. It is very rare when AC joint arthritis is the primary cause of pain. In young weight lifters, AC joint pain due to osteolysis of the clavicle is common cause of pain. Osteolysis or AC joint arthritis is the most common cause of pain on top of the shoulder. In one group in particular, the opposite is true. The AC joint is the primary cause of pain in many young, or middle age heavy weight lifters. Initially they develop a process called osteolysis of the distal clavicle. That basically means that the end of the clavicle is dissolving away (just a little). It is caused by repetitive stress. Over time it will lead to arthritis as well. Many of you with AC Joint arthritis will respond to activity modification, anti-inflammatories, and perhaps an injection. Most of you will require physical therapy to address your rotator cuff which is more than likely to be the main cause of pain. Our young weight lifters will not fare so well. Research shows that if they stop lifting they will feel better. But that just isn’t reality for most weight lifters. They wish to continue weight lifting. If you are in this group, you might respond temporarily to an injection, but many will go on to choose to have surgery on your AC Joint arthritis to clean it out and widen the space between the bones. This surgery is arthroscopic or keyhole surgery. The procedure is called a distal clavicle resection. During the surgery we remove 8-10 mm of bone from the end of the clavicle. It is ambulatory surgery and most active weight lifters are back in the gym within a few weeks. The success rate is reasonably high (80-85%) and the recurrence rate is very low. For those of you with pain in the shoulder due to arthritis of the AC Joint AND a rotator cuff tear. Recent research reveals that if the rotator cuff tear is addressed you may not need to have surgery on the AC joint as well. That is something you may wish to discuss with your doctor. I have Arthritis in my knee....what are my options? ← Do I Need a Brace After ACL Surgery? An X ray shows that I have calcification of the arm. An injection was given in my shoulder and the pains subsided and came back. The Dr. tried to remove the calcified deposit but unfortunately he missed the target hence I had a severe pains in the process so it was discontinued. He is offering between the needle(no radiologist guided) and the slit cut. Please which one should I go in for? find a radiologist or ortho who will use US to guide the injection. Rest. What are the chances of a successful surgery after 12 years? Any other suggestions? Thanks. For a true Type V AC separation, if the clavicle remains mobile then it should be able to be reduced and stabilized. not always…. arthritis can cause joint pain… but not all joint pain is due to arthritis. I am 45 and have constant pain in my right shoulder. I can not lift above my head and can not throw any ball to play catch with my kids. I have had 2 MRI’s and they just show arthritis in the AC joint no tears anywhere. I have had several different injections and take meloxicam 15mg daily and still have constant pain. Can this be remedied by any type of laparoscopic surgery? I would really like to be able to throw with my kids. 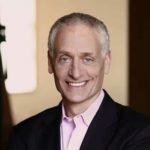 My VA Dr. tells me nothing can be done. Most of us will have arthritic changes in the AC joint on an MRI. That doesn’t always mean that it is the source of our pain. If your examination confirms that the AC Joint is in fact the cause of your pain then an Orthopedic Surgeon might discuss a procedure called a distal clavicle resection with you. It is an arthroscopic,outpatient procedure which is reasonably effective at eliminating or at least decreasing the pain due to the AC Joint.